AgriDigital has recently launched an integrated pricing solution giving Growers and Site Operators access to live Buyer Prices on the AgriDigital platform. This feature has the potential to revolutionise how you distribute your Prices to customers as they can now always access your live Prices on any device, from anywhere. 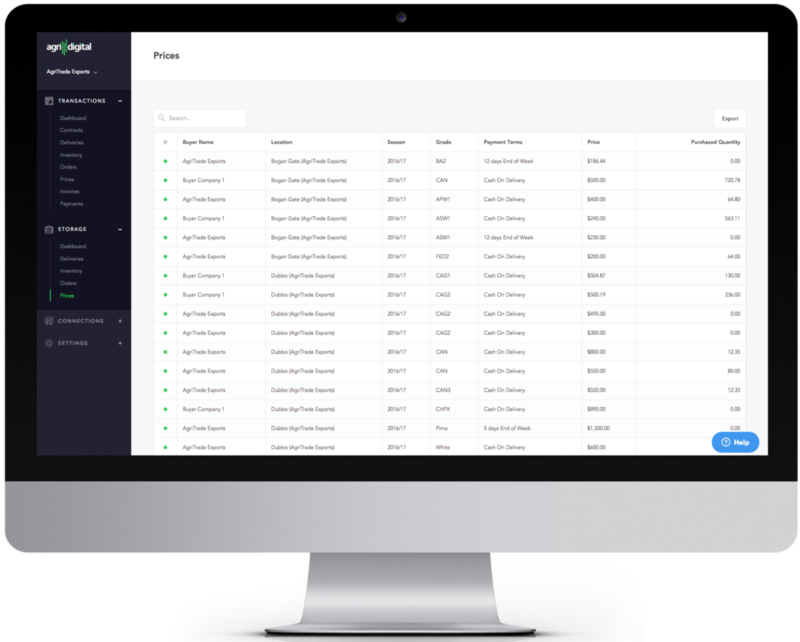 The latest release will revolutionise the way buyers distribute their prices to farmers. With farmers able to access prices in real time, there’s no risk of viewing stale, or out of data, as can often be the case with email and SMS notifications. The prices feature will also reduce the time spent on the phone discussing price inquiries. Access to live prices will empower farmers to make educated decisions about where they will deliver their grain, and whether they want to accept the current cash prices posted, or opt to warehouse and market it later instead. Should the farmer choose the deliver their grain, the current cash price will be accepted at the weighbridge, and a contract automatically generated. At the same time, the title will transfer to the buyer instantly, and the delivery will be valued and queued for payment based on the prices payment terms. The delivery, contract, and invoice are all available to view in AgriDigital by both the farmer and buyer. Plus, the prices feature is available across all devices so it is accessible in the office or in the field. The prices feature means buyers are able to track purchase volumes, and can easily update their prices as changes occur in either the market or in demand, ensuring they always remain control of their purchases. Additionally, site operators with AgriDigital are now able to provide the new prices feature to all their buyer customers too, ensuring their site is competitive and increasing the offering to farmers. This is the start of an exciting journey for AgriDigital customers, as the functionality and capability of the prices feature begins to evolve to provide a truly remarkable integrated pricing solution for the whole supply chain. With everything you need all in the one place, it’s just another reason why AgriDigital is this harvests’ essential tool.